The 99 Cent Chef food blog is one year old today! To celebrate, the Chef presents the video that launched a thousand quips: "The 99 Cent Chef Goes Shopping". Made two years ago, this video was first featured in a group art gallery show. This art performance video takes the celebrity chef phenomena to absurdist lengths -- The 99 Cent Chef goes shopping, break dancing and whips up an in store cooking demo. The Chef cooked up a fun Thai twist on Cup of Noodles to accompany the video on opening night -- incorporating a blanched asparagus spear, a few salad shrimp, two tbsp. of coconut cream, a pinch of cumin powder and hot water. Basically I catered the art opening party for free! The Chef would like to thank friends, family, fellow bloggers, and The 99 Cent Players for their contributions to his food blog videos-- they all make it entertaining and fun to do. Also, 99 thanks to the various media from the web, radio and TV for getting the word out. And finally the Chef gives his biggest thanks to his number one taste tester, Amy. She keeps the Chef from veering too far and has excellent taste. Play it here. The video runs 5 minutes 31 seconds. The 99 Cent Chef has many classic and outrageous recipes yet to come, including: a French Cassoulet and a way out Imitation Bacon Bits Pasta Carbonara. Check back to see fun and informative videos including The 99 Cent Chef Goes To Harvard, a food themed Public Service Announcement and of course, more yummy recipe videos. Cheers to all my visitors and check back soon. Go here to embed or view video at youtube. Thanksgiving at his in-laws; a meal the Chef looks forward to every year -- except this year. It's my turn to entertain. My in-laws make a great Thanksgiving bread stuffing using breakfast sausage links, and the Chef is not one to fool with perfection, however I can't help but tinker a little bit. 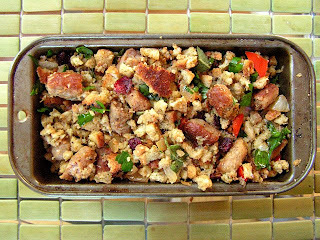 Cornbread stuffing is a Southern tradition so the merging the two and creates an In-laws Thanksgiving Sausage Link Stuffing. Extra additions include a few aromatics and fresh garden herbs. 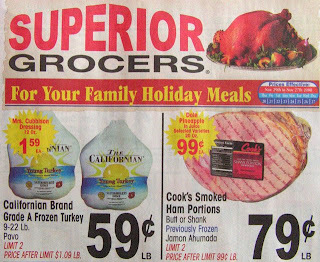 Thanksgiving is all about "gobbling" up food sales (whole turkey is 59 cents a pound here; and go here for the L.A. Times newspaper's turkey carving and easy dry-brined turkey recipe video.) So now is the time to hit your local market and stock up on ham, turkey and a few packages of your favorite stuffing. The Chef has run across a few different types at local 99c only Stores, including dried cranberry, a new favorite. The cranberries reconstitute mixed into moistened breadcrumbs when stuffed into a bird and are a sweet/tart contrast. To keep the in-laws happy, I'll leave out cranberries this time. 8 oz. package cornbread stuffing mix follow package directions. 8 oz. package breakfast link sausage - Farmer John brand is a favorite. 1 cup each of chopped bell pepper, celery and onions. 1 tablespoon chopped garlic from jar or fresh. Water and butter per cornbread stuffing mix directions. 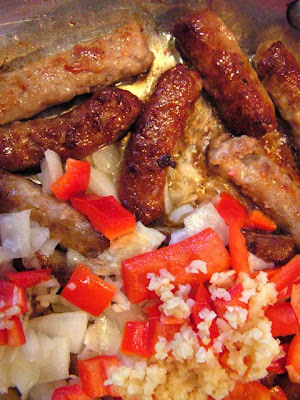 Saute and break-up sausage links, then pour out most of the rendered grease. Add veggies and saute until soft, about 5-10 minutes. Prepare stuffing according to package directions. 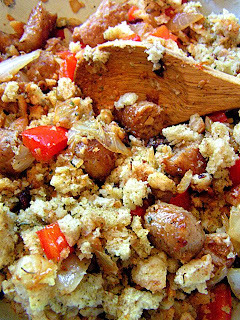 Mix prepared stuffing, toast, sausage and sauteed veggies in a large bowl. Stuff your bird and put extra stuffing in a bread loaf type baking dish. Bake extra stuffing for the last 45 minutes of roasting bird. A tasty trick is to pour out some of the juices from the cooking bird's roasting pan into the "extra stuffing" pan just before it goes in the oven with the bird. Like jars of Prego pasta sauce, jars and cans of pre-made Mexican sauces are great additions to an easy and flavorful dinner recipe. 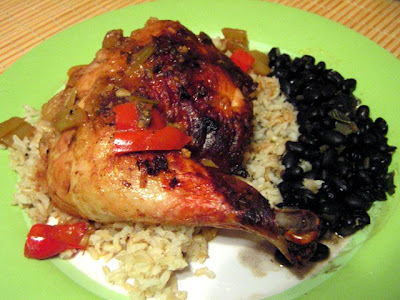 To a few chicken quarters add a can of red enchilada sauce or a jar of smoky chilpotle sauce with white wine or vegetable stock and some aromatics, then slow oven roast. 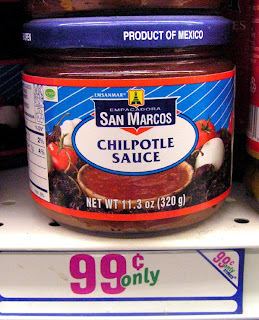 Pre-made Mexican sauces are available at any grocery store and are reasonably priced for around a dollar. Place the cooked chicken over white or brown rice; spoon on the sauce and watch the rice soak it up. Canned black beans are a good addition and a bit bland by themselves; so add sauteed onion and garlic then slow cook for a half hour for extra flavor. Saute veggies until soft, about 5 minutes in a roasting pot. Add all ingredients including wine, stock and chicken. Bake uncovered for about 2 hours. Chicken will become golden brown and remain moist in the sauce. If you leave the skin on you may need to skim off some grease before serving. * For a stove top version bring sauce with chicken to a boil, turn down heat to low and cook covered for one hour and finish cooking uncovered for half an hour. 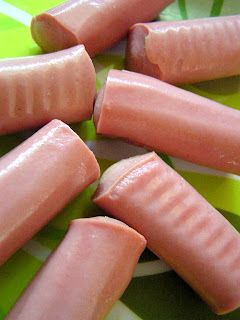 The Chef thought he had eaten his last Vienna sausage as an adolescent. Well the only thing that will get me to change my mind is turning them into mini-corn dogs! What fun this party food is. Sure to surprise and delight your carnivorous revelers, Vienna sausage corn dogs are simple to make and you can get your guests in on the frank frying fun. The corn dough coating is simple to do, just cornmeal, flour, baking power, egg, sugar and milk - a corn muffin mix from the 99c only Store is an easy way to go, as well. 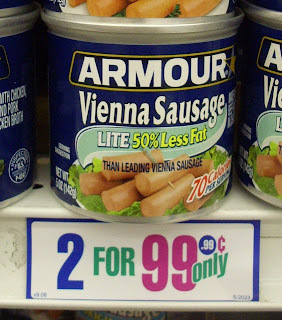 And they always carry Vienna sausages -- two seven-wiener cans for 99.99 cents. So, surprise (and shock) your guest at the next party you throw by serving these crunchy coated mini-delights and...Party On! Play it here. The video runs 4 minutes. Or 99.99c Corn Muffin Mix - follow box instructions and use as a corn dog batter. Honey/mustard - half cup of mustard and 3 tbsp. honey. Spicy Dijon - half cup of Dijon mustard and about a tsp. of horseradish sauce (add a little at a time to reach desired heat). Oriental - 1/4 cup each of ketchup, steak sauce, and soy sauce and/or oyster sauce. 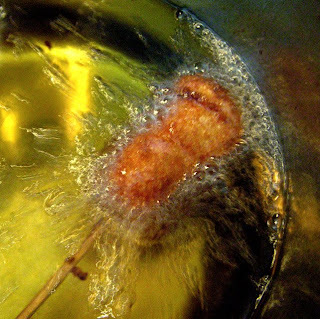 Start heating oil to 350 degrees (medium/high heat - battered corn dogs should cause oil to roil when added). Mix all ingredients into a batter that is slightly thicker than pancake batter; this will make a typical corn dog coating - the thicker the batter the thicker the corn coating. Drain Vienna sausages and pat dry. Insert wood skewers into wieners (5 inch wood shish kabob sticks - cut in half from 10 inches) and coat with corn dog batter. Deep fry in batches of five or so for about five minutes, depending on how hot your fryer is. Done when corn dogs are golden brown; watch carefully, as they will burn easily in hot oil. When adding to hot oil, allow corn dog to cook for a few seconds before adding the next one, so they do not stick together. 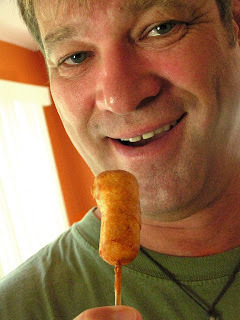 Drain cooked corn dogs on paper towels and serve with dipping sauces. 99 thanks to Charlie from NYC for his camerawork, and also all the party corn dog tasters! Also a special featurette. The Chef's mom & sisters watch "Corn Dog Party" adding funny comments. Click here. Oven-baked pears topped with whole oats are a warm sweet dessert for a chilly fall night. 99c only Stores have been stocking 2 lb. 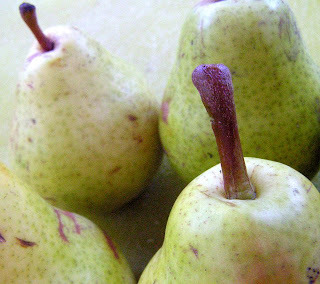 bags of Bartlett pears for the last few months and a carton of whole oats are inexpensive at any store. 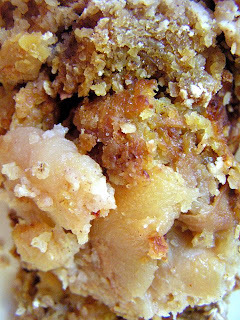 A large can of sliced pears in syrup and a few slices of butter add moisture to the whole oats crumble topping. Any firm fresh fruit will work with this recipe, including peaches and apples. Baked desserts are not the Chef's forte, but when fresh fruit is involved, it's time to get out the oven mitts. Preheat oven to 350°F. Add fresh sliced and canned pears, lemon juice, flour and brown sugar to lightly oiled deep-dish "bread loaf" pan, reserving 1 cup of syrup. In a bowl mix oatmeal, flour, cinnamon and oil or butter and drizzle pear syrup into oatmeal topping. 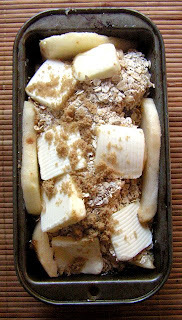 Place oatmeal topping mixture over pears and bake uncovered for about 45 minutes. Next up, a new video: "Corn Dog Party!" This video provides the lowdown on preparing a fun 99.99 cent appetizer sure to please your most jaded reveler! 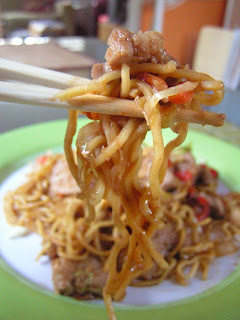 Yakisoba is Japanese street fast food. A riff on chinese stir fry noodles, it is easy and quick to do, especially with a package of 99.99 cent pre-shredded raw cole slaw and soft pre-cooked chow mein noodles. The Chef's early work experience included shepherding Japanese news crews covering L.A. hot spots -- we would often end up in Little Tokyo downtown for Kirin beer and yakisoba; a satisfying denouement to a frenzied shooting day. Yakisoba noodles are a little heavier than ramen, and 99c only Stores are carrying 7 oz. 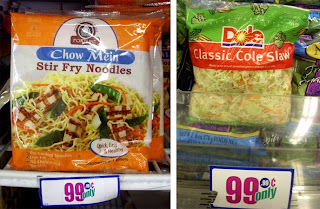 packages of pre-cooked chow mein noodles in the cold deli case that are very similar. Just pick up some protein from your local ethnic market - the Chef picked up pork loin chops on sale for under a dollar a pound (chicken is even less), to go with this delicious Japanese fast food staple. 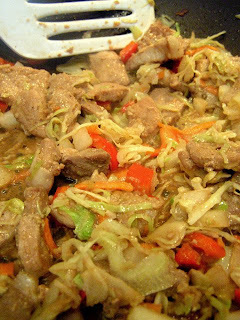 With or without meat the Chef's Double Deal of the Day of stir fry noodles and cabbage is savory comfort food with an oriental take. 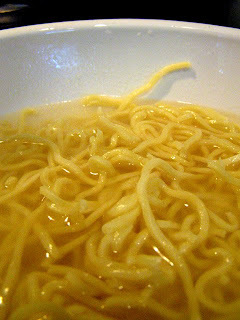 Remove noodles from package and soak in a bowl of cold water, so noodles will separate. Since they are already cooked, all you need to do is drain and add them at the end for reheating. 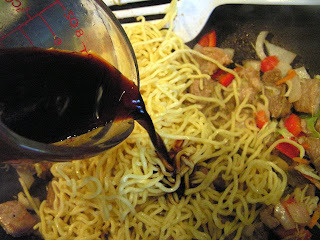 While noodles are soaking, saute meat in hot skillet with 1 tbsp. each sesame oil, garlic and soy sauce until done, about 5 minutes. Add cabbage, extra veggies with tbsp. oil and stir fry for a couple of minutes. Drain noodles, add to stir fry and pour-in Tonkatsu sauce, mix well and heat through for a couple minutes more. Ready to serve. 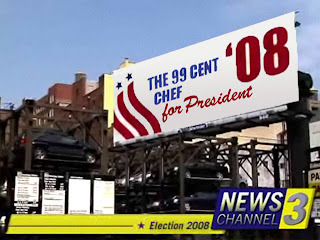 Throwing his whisk into the presidential race, the Chef breaks out of the kitchen with a couple of voting day videos! 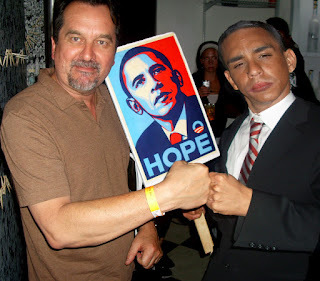 The 99 Cent Chef encourages his readers to get out and vote Tuesday. Participate and help make a difference. Republican or Democrat, all parties are welcome to the Chef's dinner table! Click here to see the Chef's media campaign video coverage, then click on the "White House" image to play video. As for local propositions, the Chef supports public rail and subway bonds; the sooner we get off the "dinosaur teat" (oil) the better. 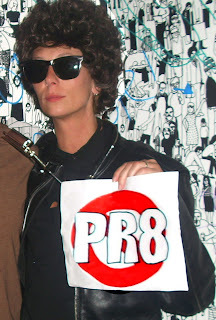 Rock poet laureate Bob Dylan, here played by a black pleather clad, harmonica brace wearing Cate Blanchett look-a-like circa 1965 album Bringing It All Back Home; holds a "No on Prop 8" sign. The Chef agrees with Ms. Tambourine Man. You can also refer to his Gay Wedding Cupcakes video. Need more convincing to vote? 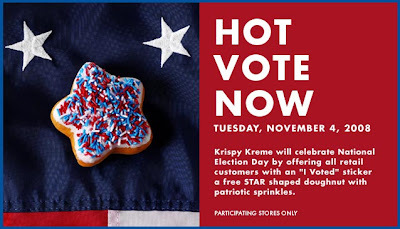 Krispy Kreme Doughnuts is giving away a free red, white and blue sprinkled star shaped doughnut when you show your "I voted" sticker, and Starbucks is pouring free 12 oz. cups of coffee. While at work, the Chef had his headphones plugged into NPR news radio all afternoon listening to the Presidential Election results coming in. 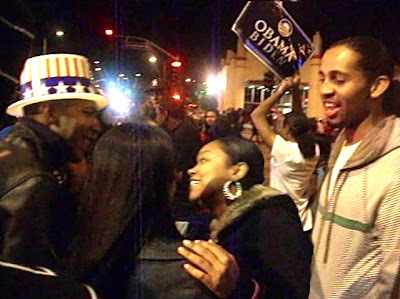 Later, after the Chef plopped onto the couch in front of the TV with beer and Trader Joe's Tart Alsace (a fancy pizza topped with caramelized onions in a cream sauce) to listen to McCain's honorable concession speech and then Obama's exhilarating acceptance speech, his wife suggested heading down the street to Leimert Plaza in the Crenshaw District of South L.A. to see if anyone was celebrating. Wow, were they ever! Check out the video -- apologies for the blurry video, as the Chef had one too many celebratory alcoholic beverages and he incorrectly set his camera to low resolution. Play it here. The video runs 1 minute 52 seconds.